Ahmed Mughal Sindhi Classical Music Singer. He is most popular Sindhi Folk Music Artist. He has sung lot of Sindhi Cultural Songs in Sindhi language. Ahmed Mughal is most popular Sindhi Singer and he create great name in Sindhi Music. He is brother of the popular Sindhi Singer "Sarmad Sindhi" "Rehman Mughal". Ahmed Mughal is famous among young generation and he sung all kinds of songs, like as, Sindhi Classical Mousiqui, Sindhi Pop Music. He is most demanded Artist in Sindhi Cultural. He is most Artist due to he has sung "Sindh Dherti Songs". He has sung poetry of popular Sindhi poets, such as "Hazrat Shah Abdul Latif Bhitai R.A", "Hazrat Sachal Sermast R.A", "Shaikh Ayaz" and other latest famous poets of Sindh. 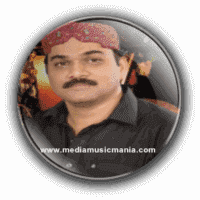 His struggle in Sindhi Music is admirable and he love with Sindhi Songs. When his latest Albums coming in the Market peoples also wait for their hit songs. Ahmed Mughal also praised of his homeland "Sindh Dherti" in his great songs. He is now now very famous in "Sindh TV", "Mehran TV", "KTN TV", "Kashish TV", and also on other local Sindhi TV Channels. He has sung unforgettable "Sindhi Kalam", in the style of his great brother Sarmad Sindhi. Ahmed Mughal has invaluable experience, in Sindhi young cultural songs, his most popular song is "Jeay Sindh Jeay Sindh Wara Jeean". I have selected below most popular Music of Ahmed Mughal.